This voucher is for one Surf Survival (B4s) clinic. Surfing is one of the world’s most demanding activities. The level of activity can vary from calm, slow, easy surfs to explosive, fast and extreme experiences. No matter what level of surfer you are, no matter what waves you surf – you could benefit from learning how to improve your breath-hold and core strength. 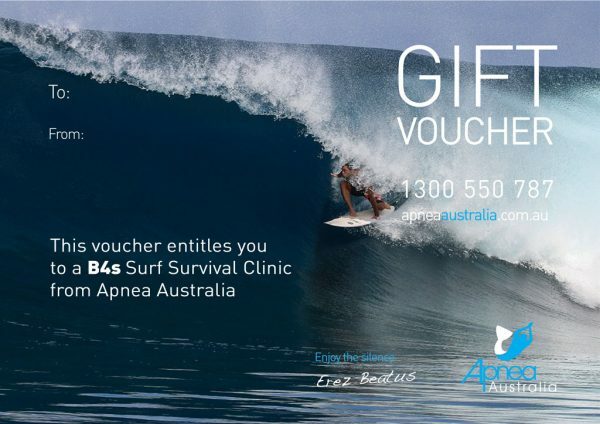 Apnea Australia offers Surfing oriented breath-hold and core training workshops in Australia and the Pacific. There have been many discussions as to what training is best suited for surfing in general and big-wave surfing in particular. Most surfers end up practicing the “rock running” drills and similar drills. After years of experience in the field of breathing and high performance training we have developed a system that will maximize your ability to perform in the likely event of getting caught under a wave.